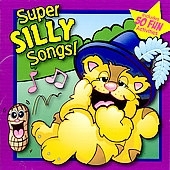 Everyone will giggle, smile, and sing along with this super new collection of silly songs. Get the wiggles out with action movement songs and laugh together with classic nonsense songs! This great CD will provide for hours of fun for kids and families. Perfect for home, classroom, sleepovers, parties, rainy days, traveling--anytime! BONUS! Includes 50 fun things to do with kids!